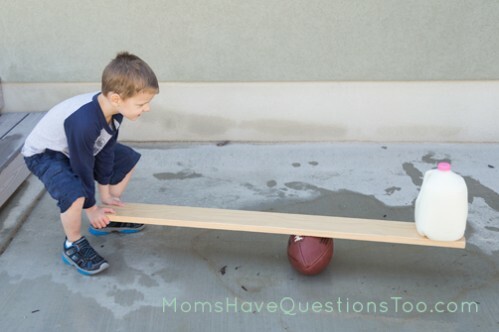 What are some science activities I can do with my toddler and/or preschooler? I am so excited to be starting a fun blog hop with some amazing bloggers. 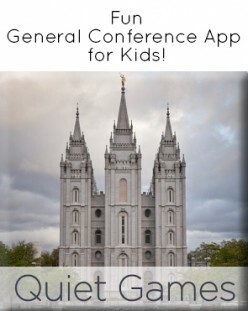 We’ll each share a science experiment or activity that can be done with toddlers or preschoolers. Science is often a forgotten subject in preschool because so much emphasis is put on math and reading. Science is so important though, plus it can be one of the most exciting subjects for preschoolers. Little Bear loves science right now so I am way excited to take advantage of that. 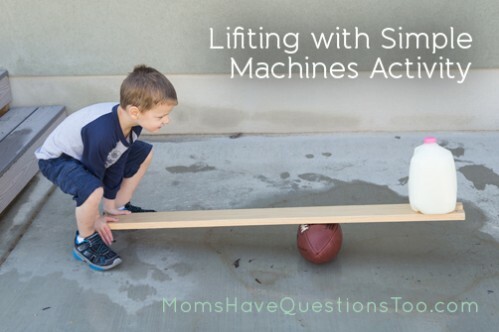 The science activity I did with my kids is all about simple machines. The 6 basic simple machines are pulley, lever, inclined plane, wedge, wheel and axle, and screw. For our activity, we focused on the first three: pulley, lever, and inclined plane. 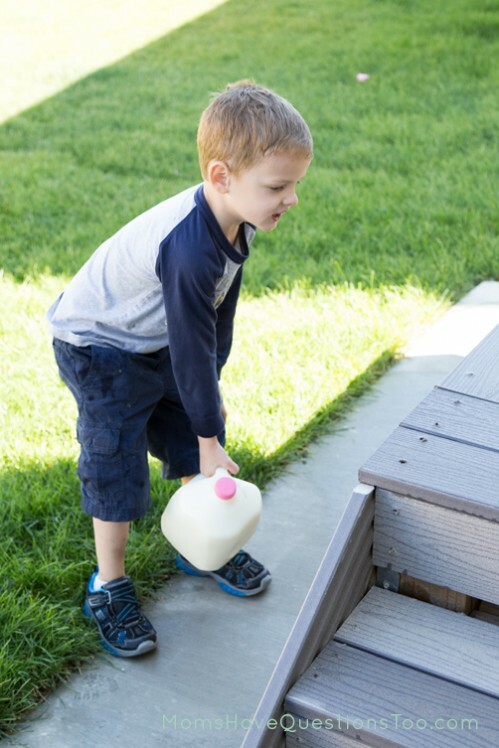 I started by putting a full jug of milk on the ground and I asked Little Bear to lift it up and set it on the top of the stairs leading to our back door. Apparently Little Bear has been secretly working out because he was able to do this without any help. I didn’t think he’d be able to lift it that high, but luckily it was very difficult for him so I explained that by using simple machines, it would be much easier to get the milk jug up that high. I started by laying a long board against the stairs and I set the milk jug at the bottom of the board. 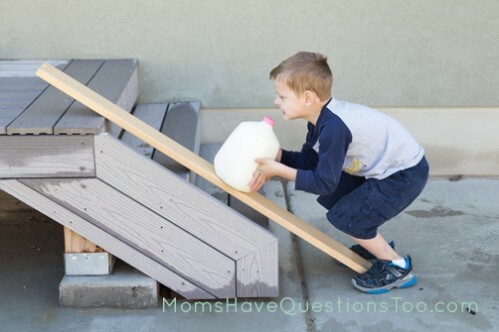 I told Little Bear to push the milk jug up the board to get the milk to the top of the stairs. He did this and said it was easier to get the milk jug up that high by pushing it up the board than just by lifting it. I wish my board had been a little longer because I think it would have been much easier to push it up, but I just used what we had and it still worked. I got the same board and put a football underneath it. I made sure to put the football much closer to one side than the other because I knew that would make it easier to lift the milk jug. The milk jug went on the short side and I asked Little Bear to push down on the long side to lift up the milk jug. Little Bear was really impressed at how easily he could lift the milk jug. This was definitely his favorite simple machine. He kept lifting and lowering the milk jug over and over because it was so easy. 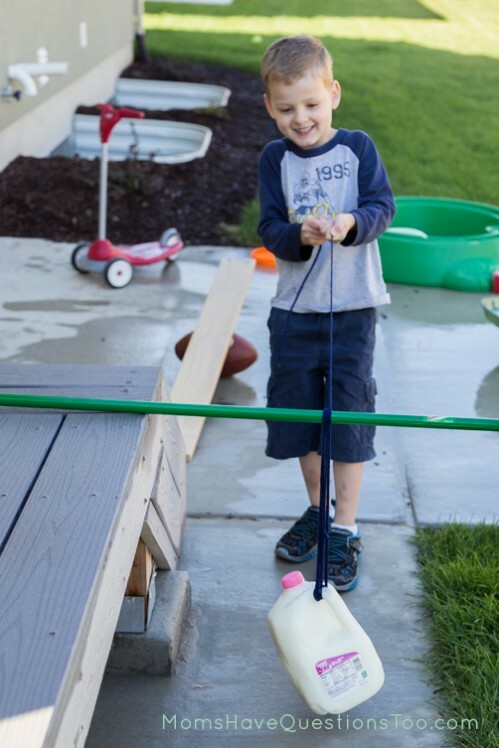 I made a simple pulley by tying some thick yarn to the milk jug, then I wrapped it several times through the milk jug handle and over a broomstick that was resting on top of the stairs. I think I wrapped it about four times, but I don’t remember for sure. When I was done wrapping, I had Little Bear grab the end of the yarn and pull it to lift up the milk jug. He was able to lift it much easier than the first time. Again, he thought it was so cool that it was so much easier.